Lu is a professional artist and a concept photographer. He was born in 1974 in the city of Meizhou, Guangdong province. After graduated from the Art Department of Xijiang University (now known as Shaoqing Institute) in 1995, Lu took up a few jobs including art lecturing, graphic design and body tattoos etc, before he concentrates on painting and photography. 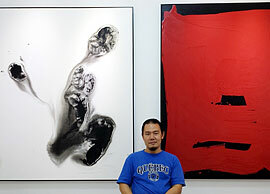 In 1998, Lu’s works of art were being awarded in two significant art competitions in Guangdong province. In the 90s, Lu began to contemplate on abstract paintings. Subsequently in 2008, David Abstract Art Studio was established to pursuit Lu’s abstract world of art. Lu is currently residing in Shenzhen.